(Dan Trimmer, 2001). Tet. 30” EM Sev. Re. (Unknown Sdlg. 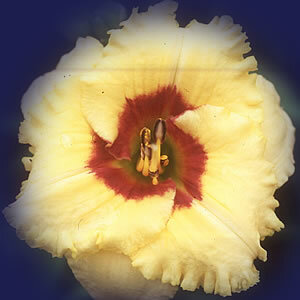 x BABY MOON CAFÉ) This 3 ¼” round ruffled pale yellow infused green bloom has a wine red eye and green throat. PEANUT GALLERY has three lateral branches and typically 25-28 buds. An excellent performer I expect this peanut to perform well north and south. A blooming mass seems to dance in the light with well spaced blooms.